Any stepper motor can be used as a generator. In contrast to other generators, a stepper motor produces a large induced voltage even at low rotational speeds. The type used here, with a DC resistance of 2×60 Ω per winding, can generate more than 20 V when turned by hand, without any gearing. 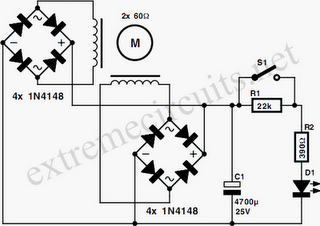 The circuit diagram for a ‘hand-cranked torch’ shows how you can use a stepper motor as a generator. A supplementary circuit stores the energy. Two bridge rectifiers, each made up of four 1N4148 diodes, charge the 4700µF capacitor. The super-bright (white) LED is driven either via a 390-Ω resistor (Power Light), or via 22 kΩ in series with 390 Ω. In the latter case, the LED is not as bright, but it stays on longer. You must restrain yourself when cranking the dynamo, since in the ‘bright’ setting it is possible to exceed the rated LED current of 20mA, while in the ‘long’ setting it is possible to exceed the rated capacitor voltage of 25 V. If necessary, adjust the value of the LED series resistor. The lamp is bright enough for reading in complete darkness. The stepper motor generator is thus ideal for spies, thieves and children who want to read under the bedcovers. You could also keep it handy in your hobby room, in case of a short circuit.